MANOWAR - BATTLE HYMNS 2011 - BORN FOR LIVE FOREVERMORE (CD) | Online Shop | Wizard LTD. Album: "BATTLE HYMNS 2011 - BORN FOR LIVE FOREVERMORE (CD)"
Finally, technology has caught up with MANOWAR&apos;s custom-built touring and recording equipment. The band decided that their fans deserved to hear the songs from their debut album Battle Hymns with the massive sound and production that has become their signature over recent years and records. Due for release at the end of November 2010, Battle Hymns will soon be available with the unbridled power of today&apos;s technology: Battle Hymns 2011. With the decision to reinterpret the music came the need to revisit the famed narration of the legendary Orson Welles. There was only one obvious choice and that was Sir Christopher Lee. Recorded at the famed Abbey Road Studios in London, his own inspired interpretation of the late, great Orson Welles on "Dark Avenger" will be another jewel in the crown of the Kings Of Metal. MANOWAR Bassist and Producer Joey DeMaio stated: "My personal admiration for Sir Christopher began many years ago while watching his films. It increased when I was honored to produce him as a singer and as a narrator and we became friends instantly. Immediately after hearing the sheer power and range of his voice I thought I should write a narration; I never imagined we would ever rerecord Battle Hymns - but here we are and it is massive." Battle Hymns 2011 will feature two never released before live versions of "Death Tone" and "Fast Taker" recorded during the band&apos;s very first concerts in 1982. These are the rarest bonus materials ever released to date in MANOWAR&apos;s career. "Our fans can be sure that we have squeezed every drop of power into Battle Hymns 2011 that today&apos;s technology allows", says vocalist Eric Adams. 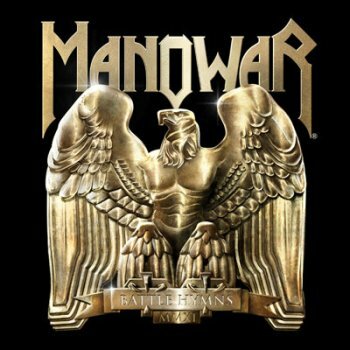 MANOWAR is poised to prove that both the band and the immortal Battle Hymns record are indeed "Born To Live Forevermore". Battle Hymns 2011 - a new chapter in Heavy Metal history.